This step is perhaps the most critical. It adds a personal touch, makes the frame unique and gives it a certain personality stock frames don’t have. It also makes it superior than the previous Inbred I had. When a bike is stolen from you, you have to replace it with something of a higher quality. You have to move on and up. Bigger and better. I call it the George Jefferson effect. I guess it rationalizes the emotion somehow (I never liked that bike anyway). I accomplished this by ordering cable guides and ISCG tabs from Paragon Machine Works. 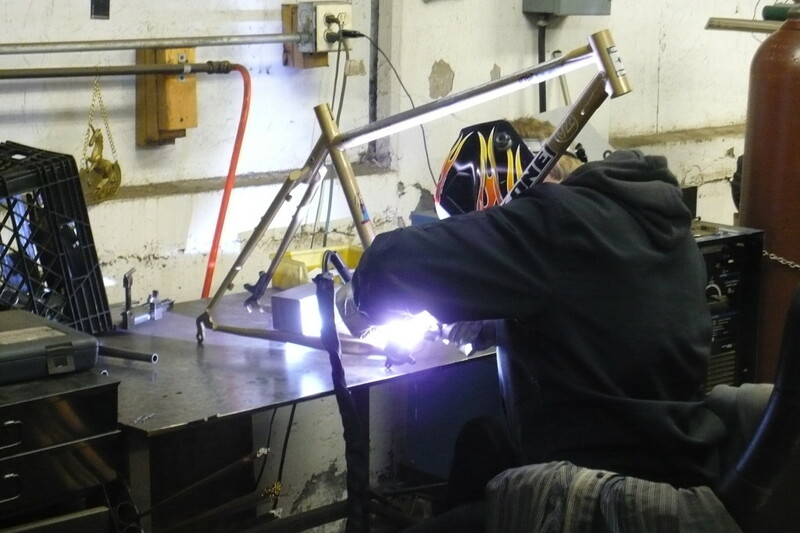 I ordered six large miter guides (for the top tube) and two small miter guides (for the seat stay). 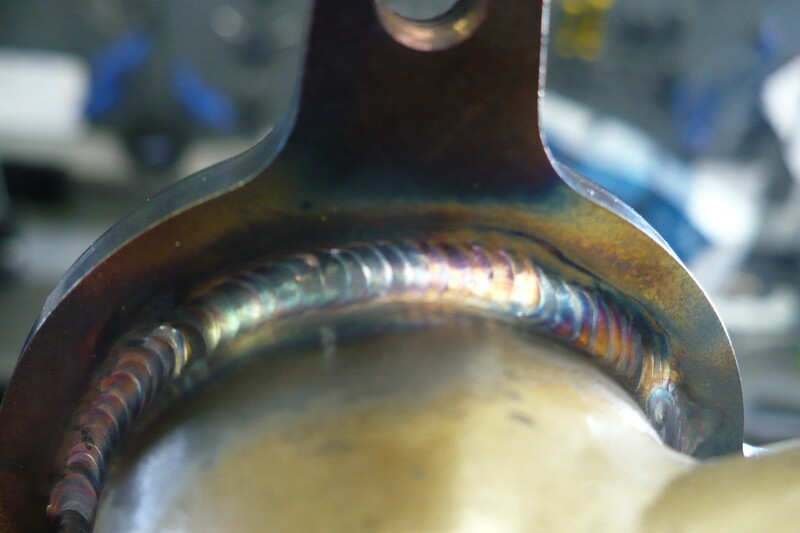 Cable guides, beautiful cable guides! That very same day the parts arrived, my welder Paul called and asked if I could come out to Binghamton that night to have him do the work. I wanted this bike ready for my trip to Ray’s Indoor Mountain Bike Park the next weekend, so I drove out. We got started on the ISCG tabs since they would require the most work. 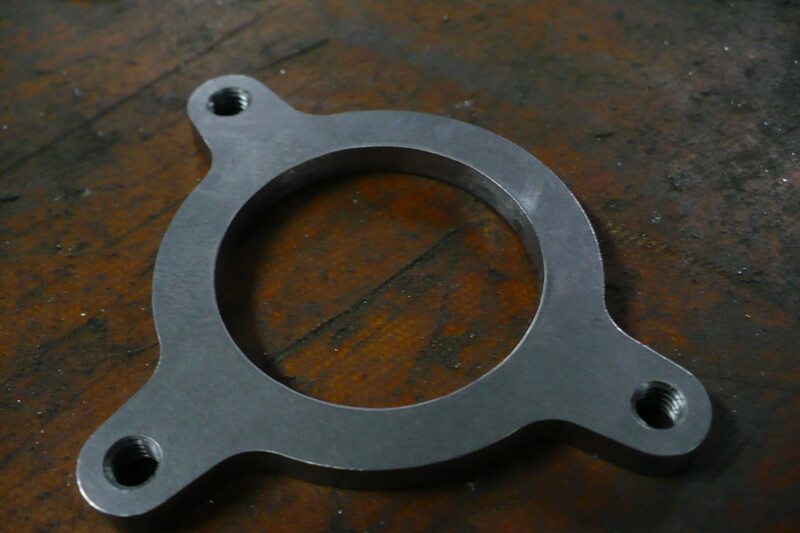 The inner diameter of the plate was smaller than the outer diameter of the bottom bracket shell, so Paul mitered the hole bigger with a 1.5″ bit. Unfortunately this still wasn’t enough to fit over the shell so I went to work with the grinding wheel and enlarged the hole a little bit more. The back side also needed to be ground down to clear the chain stay. 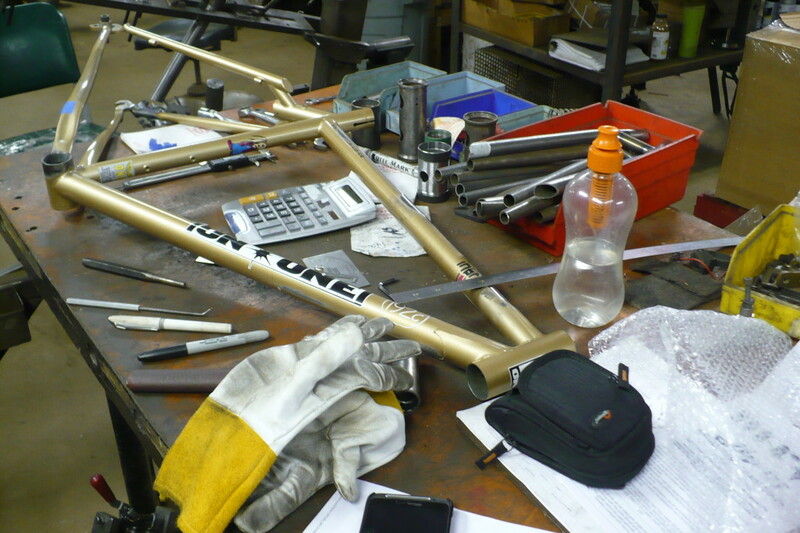 It took a while – grind, test fit, grind, test fit, so on and so forth. While I was doing that Paul turned his attention to that pesky brake mount. He used a wire wheel to take the paint off and laid down a gorgeous bead to gussy it up a bit. By then I had the ISCG plate ready, so we refocused on that. Tab placement was tricky. 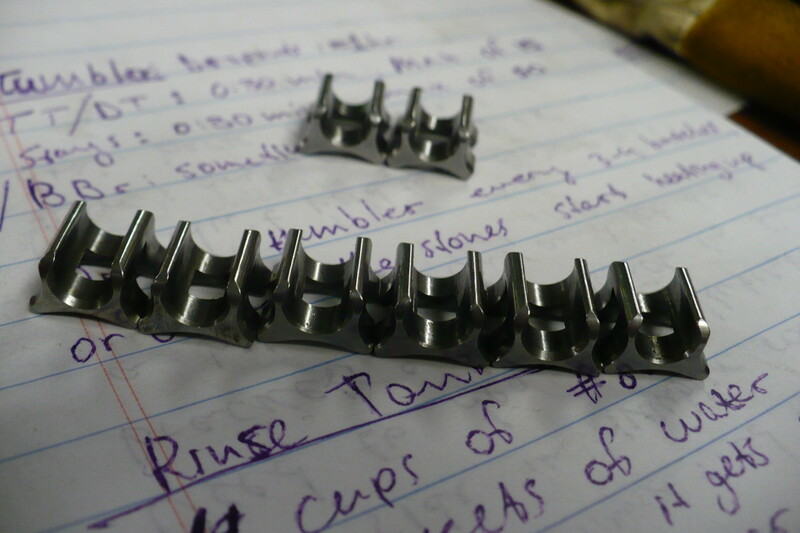 The ISCG standard specifies that the plate sits 2.5mm recessed from the face of the BB shell and that the rearward tab sits at an angle of 50 degrees from an imaginary center line between the rear drop out and the BB. 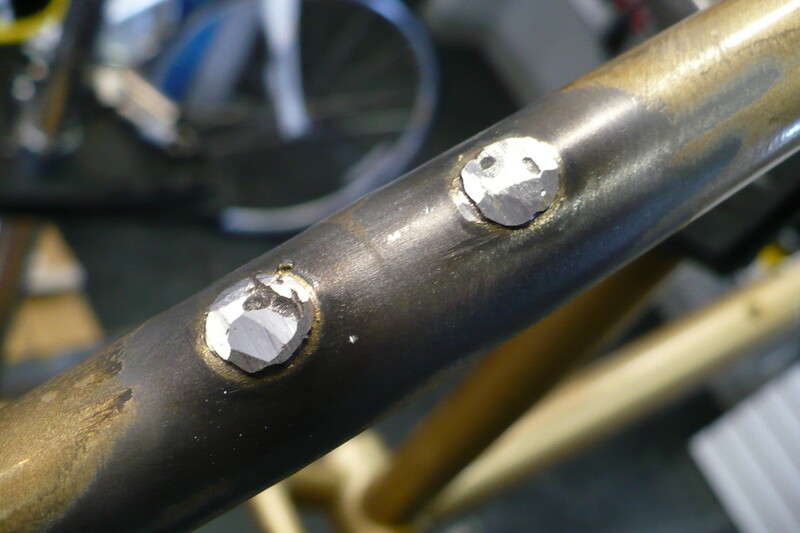 Creating a center line wasn’t hard – we installed a dummy axle and ran a string from that to the center of the bottom bracket then used tape to mark the line. Once we had a reference line to work off, we protracted the angle and marked the shell and the plate. The tricky part is creating the 2.5mm recess. 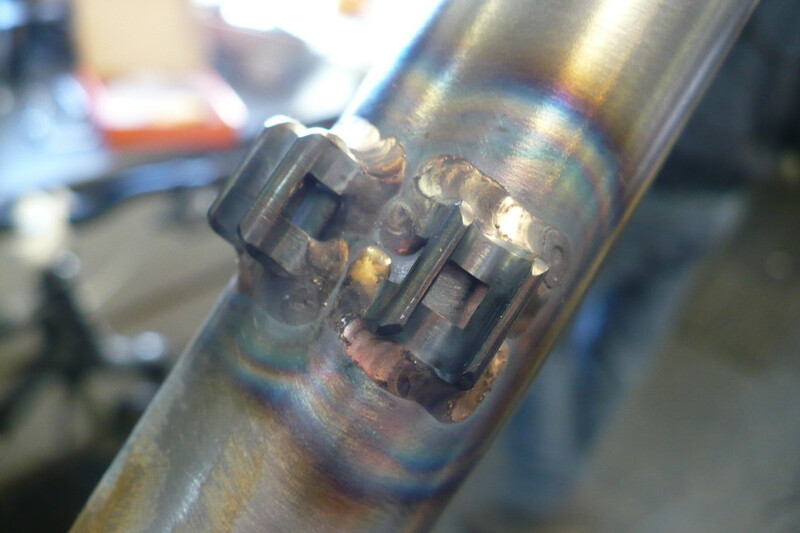 We used a BB-mount ISCG tab, allen bolts and an old bottom bracket to create a surface upon which to rest the plate so Paul could tack it in place. I’ve read about frames with chainguide tabs that are just tacked on and snap off when the guide took a hard impact. While the odds of that are slim there’s no sense going to all this trouble and risking it. 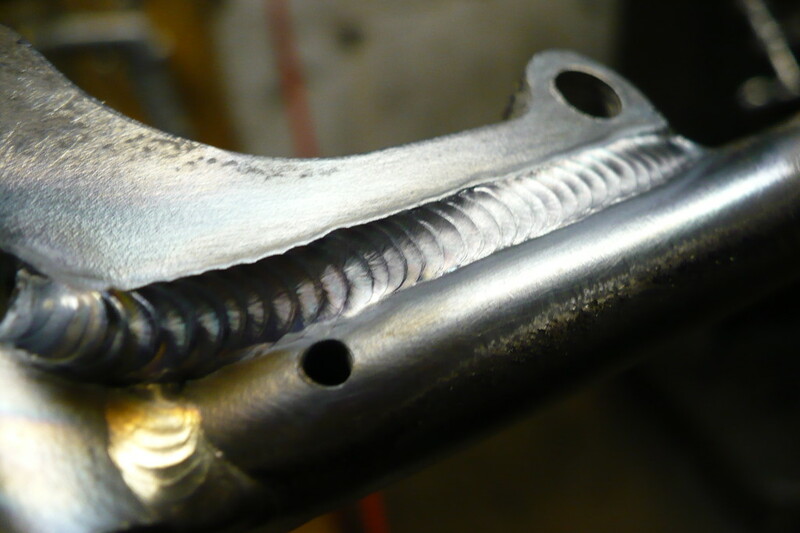 Paul laid an immaculate “stack of dimes” weld around the whole perimeter. With the tabs all finished we transitioned to cable guides. While the original guides were on top of the top tube, we opted to mount them underneath where they would look cleaner. 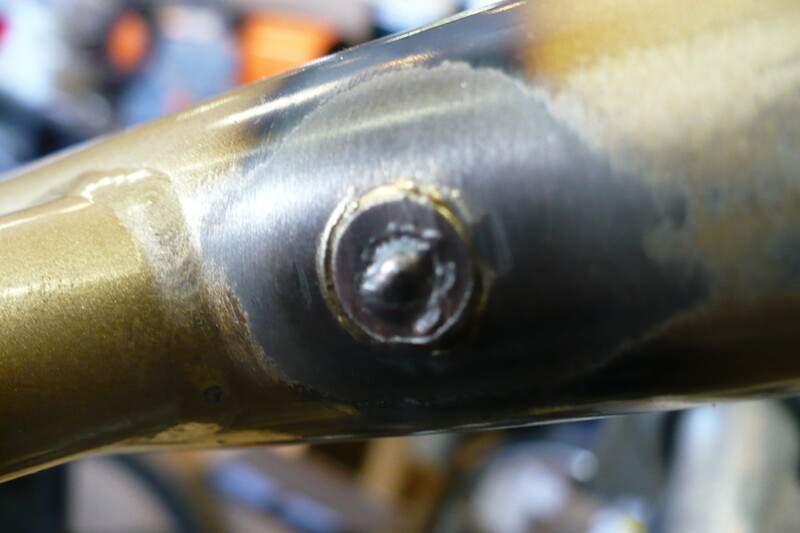 Paul also suggested running the brake hose under the seat stay to match the derailleur cable. Welding these was pretty straightforward once we figured out placement and soon enough we were on to my final request: filling rack and v-brake mounts. By now it was close to midnight and since these required the least preparation we did it the quick and dirty way. 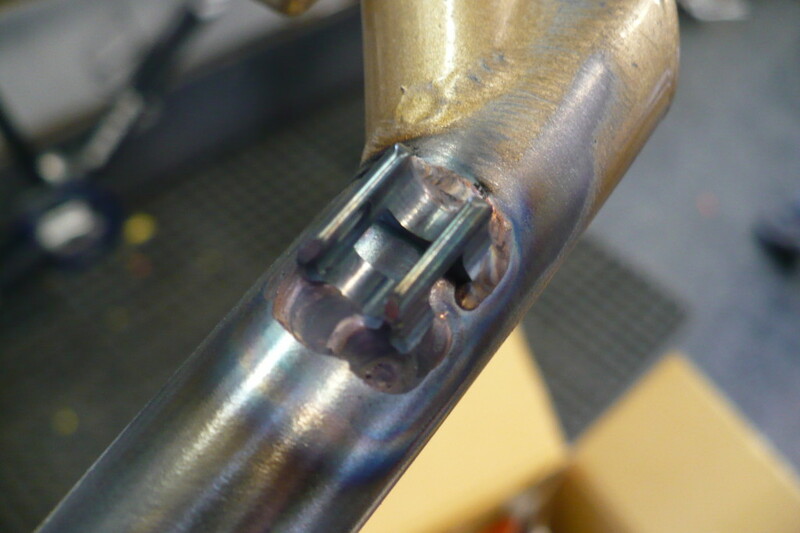 First we ground down the heads a bit, and then Paul filled the threaded fitting. 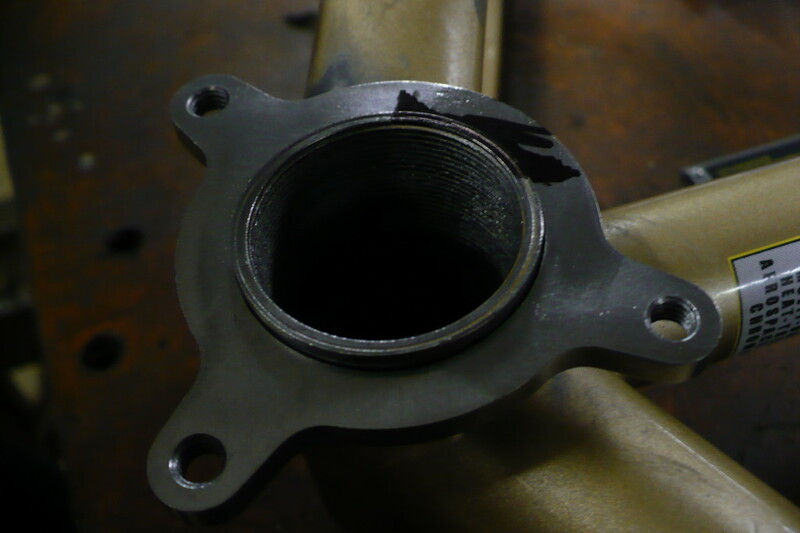 There was a little hesitation, as these fittings were originally brazed into the frame and when Paul welded the filler, the brass more or less melted and threatened to move the placement of the braze on. Fortunately it solidified quickly and there were no issues. We left the grinding for another day and I went home.